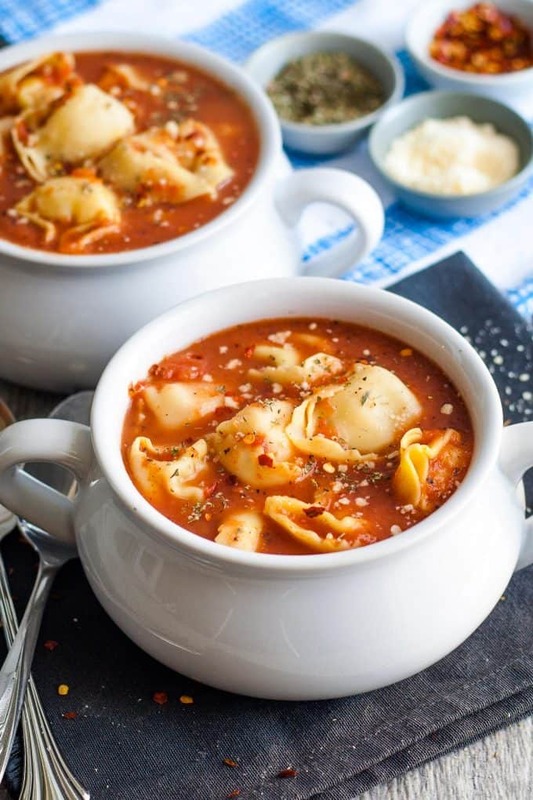 Tomato Tortellini Soup – Only 3 Ingredients! 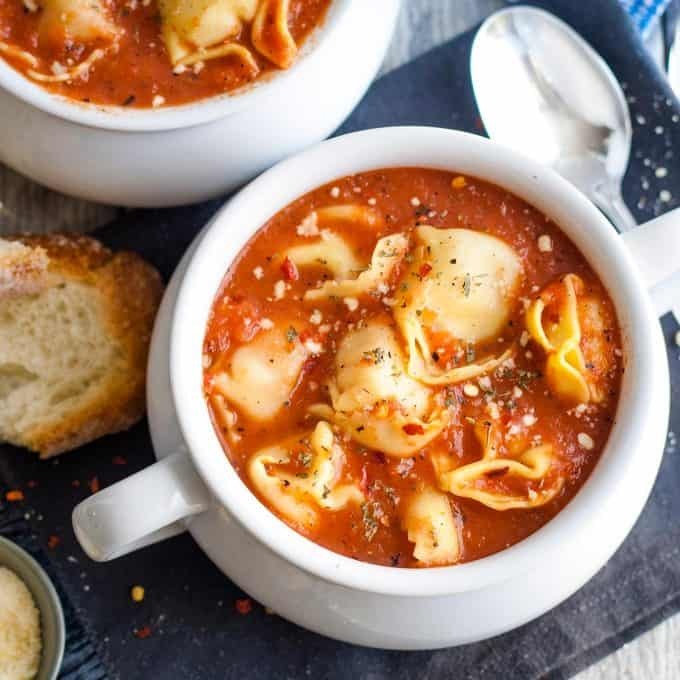 3-Ingredient Tomato Tortellini Soup – if you’re short on time, make this soup! It only takes 15 minutes from start to finish and is full of flavor. I’m such a soup person that I spend hours thinking about soup. Okay, maybe not hours each day, but I do spend a lot of time planning what soup I am going to make or eat next. My 3 ingredient black bean soup has been so popular that I decided I needed to test out another 3 ingredient soup recipe. My new recipe, this recipe, is just as easy… and may even taste better. 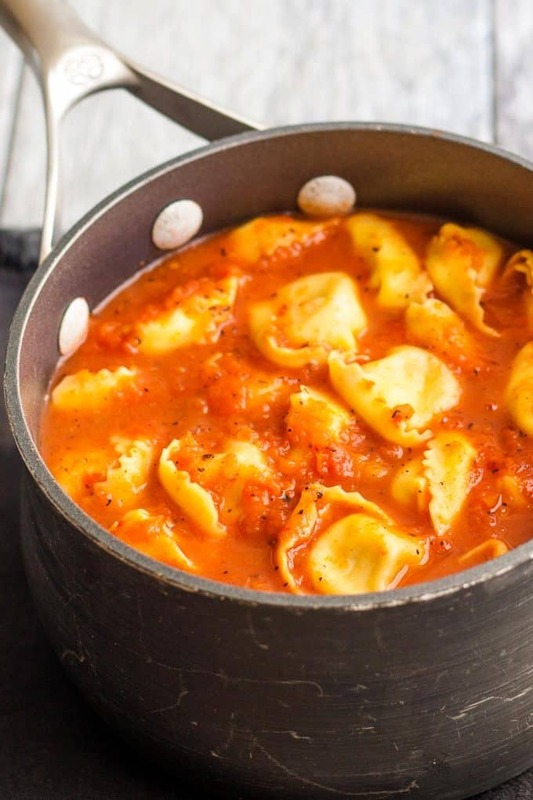 You need only three ingredients, a soup pot and an immersion blender to make this 3-ingredient tomato tortellini soup recipe. 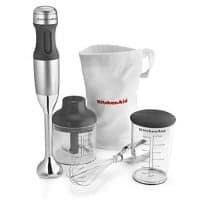 Our immersion blender is used daily over here and we would be LOST without it. I highly suggest you purchase one asap. I highly suggest chicken stock over chicken broth but you can substitute broth if that is what you have on hand. The fire-roasted tomatoes, on the other hand, are a big part of the flavor of this soup. They add an extra layer of flavor that plain diced tomatoes just doesn’t carry. I usually just season to taste with some salt but we have also garnished with a little crushed red pepper, parmesan, and oregano. Sound like something used for pizza? Well, we ordered pizza and had leftover toppings and I found them a home. 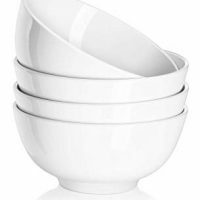 What kind of tortellini should I use? For the tortellini, use any flavor – we have made it with cheese tortellini, prosciutto tortellini and mushroom tortellini. All ways were fabulous. As with many recipes with few ingredients, you are going to start imagining what you can add to it. They kind of became a canvass for your tummy. Brings a whole new meaning to palette when it pertains to food, right? Cream of Tomato Tortellini Soup – Add 1/2 cup heavy cream or milk after cooking the tortellini. Stir well. 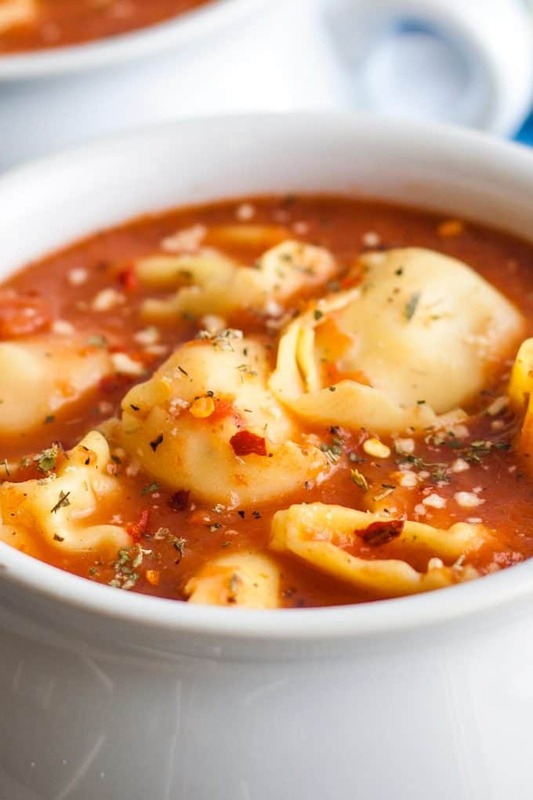 Fiesta Tomato Tortellini Soup – Add 1/4 cup cilantro with the chicken stock and tomatoes. Squeeze the juice of one lime into the soup. 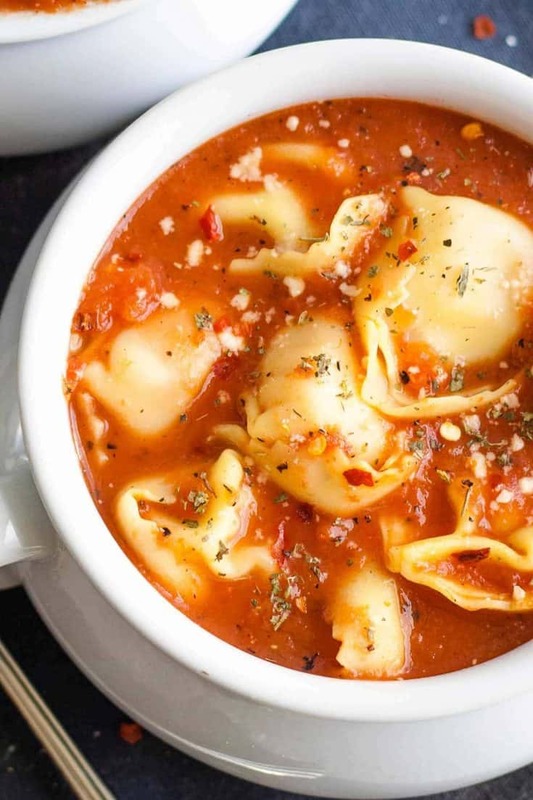 Tomato Basil Tortellini Soup – Add 1/4 cup basil with the chicken stock and tomatoes. 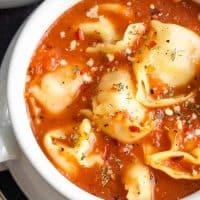 3 Ingredient Tomato Tortellini Soup - if you're short on time, make this soup! It only takes 15 minutes from start to finish and is full of flavor. Add the chicken stock and fire roasted tomatoes to a medium pot and bring to a boil over medium-high heat. When at a rolling boil, turn off heat and puree with an immersion blender. When pureed, add the fresh tortellini and cook for 3-4 minutes (read the package directions.) Turn off heat and serve hot. 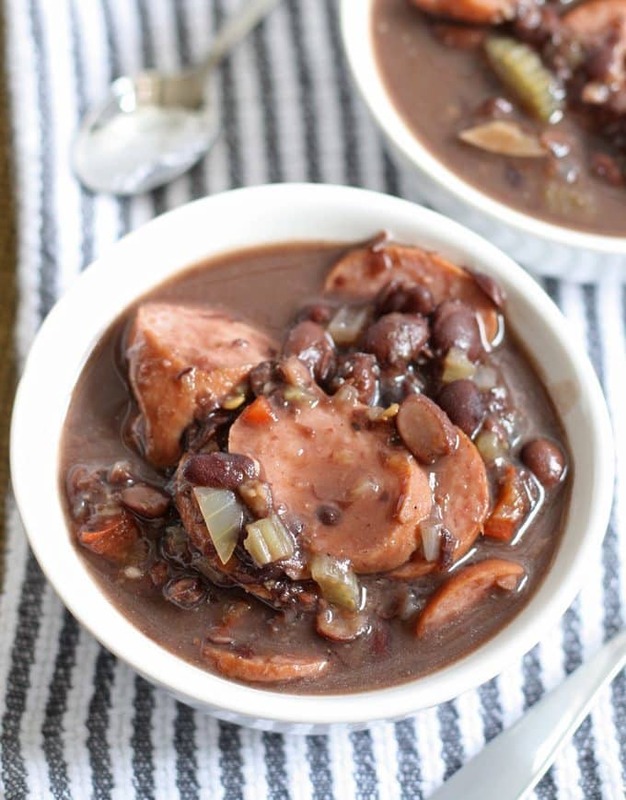 or this slow cooker black bean turkey sausage stew! I would love to dig into a big pot of that right now! Totally comfort food at it’s best! 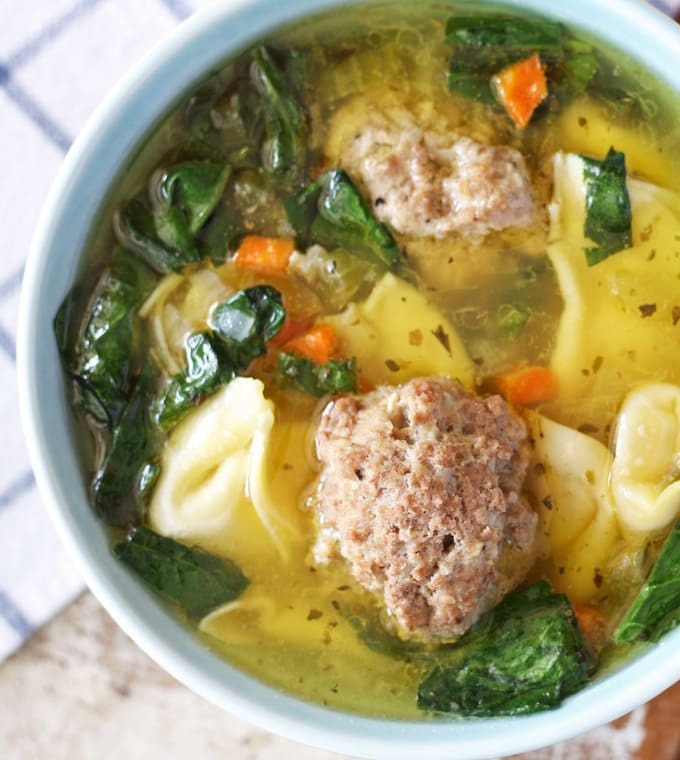 I love love tortellini and this soup looks perfectly comforting. Tortellini is awesome – glad I’m not the only one who thinks so! Looks delicious. And only 3 ingredients! I can see quickly cooking this up for lunch. Totally! It is perfect with a salad or small sandwich! This sounds like such a great Winter dish! 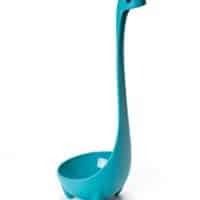 Wow this soup looks delicious! The texture on the tortellini makes me so hungry right now. Pinning for sure! Thank you Derek! And thanks for pinning. This is the best lunch of all times for me! Thank you for sharing this delicious soup!!! I have one similar to this soup with spinach, but with added cream cheese…yikes!!! What an awesome recipe to have on hand for a busy weeknight – love this! This is my kind of recipe – fast, easy, and tasty!! Girl, you had me at 3 ingredients! I buy tortellini on a regular basis so this is totally happening! I LOVE that you used fire roasted tomatoes, too! Those are my favorite kind! What a delicious and super simple looking soup. I love that it only takes 3 ingredients! Yay for only 3 ingredients!!! I’ll definitely be making this as soon as our weather cools down! Jenny, that looks great! I’ve never purchased tortellini before. Must check it out. Yes please! This soup looks so delicious, perfect for the chilly night ins. Mmmm this soup sounds delicious! And so easy to make too. My boys love tortellini and I would love to sneak more veggies into their food so this would be a win-win meal for us! Thanks so much for sharing with us at The Bewitchin’ Block Party! I’ll be featuring you in the morning. I hope you can join us again this week. This looks delish! I know you said the fire roasted tomatoes really make the taste, but would they work for a younger child? I always just buy plain ones, so not sure how the heat is in fire roasted for a more delicate palate. Any suggestions? Hi Amanda! The fire roasted tomatoes add a smokiness to the soup – if you wanted to use plain tomatoes, you definitely could. You may find the flavor a little bland – if you do, I would add a little oregano or pepper. 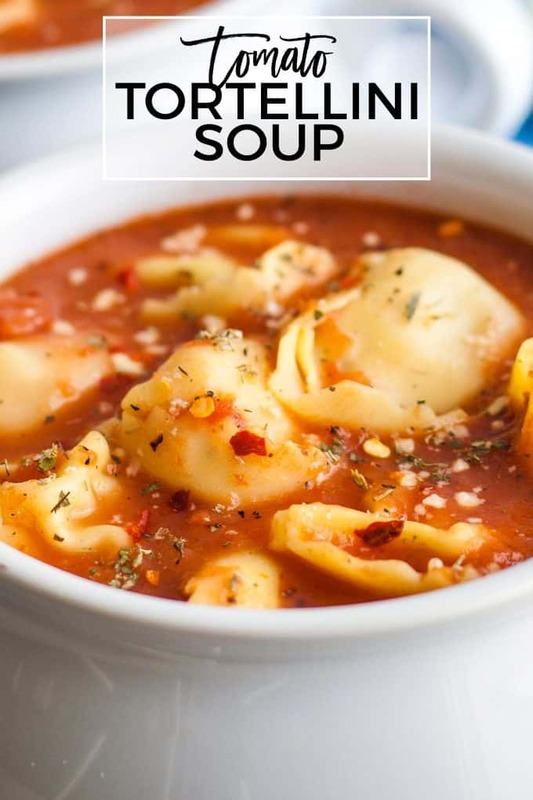 How many servings does the 3 ingredient tomato tortellini soup make? Hi Zelda! It makes 4 large servings. Would love to make this, however I don’t have an immersion blender…any suggestions??? You can use a tradition blender instead – just puree in small quantities! My mom makes a version of this soup with sausage and veggies! It is so delicious! ??? ?